Bellagio is a small town on the shores of Lake Como in northern Italy. 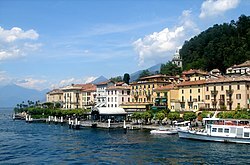 The southern part of Lake Como is split into two branches by a peninsula. The peninsula is shaped like a triangle. Bellagio is on the northern tip of the peninsula. In 2017 about 3,700 people lived in Bellagio. The Ancient Romans called the town Bilacus. ↑ http://www.demo.istat.it/pop2017/index3.html; Istat; retrieved: 9 September 2017. ↑ ISTAT (Italian Institute of Statistics). Bellagio. Retrieved 27 November 2017 (Italian). ↑ Macri, Rosmarie (2015). Fascinating Lake Como: travel guide for discoverers. Troubador Publishing Ltd. pp. 130–135. ISBN 978-1-78462-962-5. ↑ AICCRE (Associazione italiana del Consiglio dei Comuni e delle Regioni d'Europa). Gemellaggi della Regione Lombardia. Retrieved 27 November 2017 (Italian). This page was last changed on 13 October 2018, at 05:57.